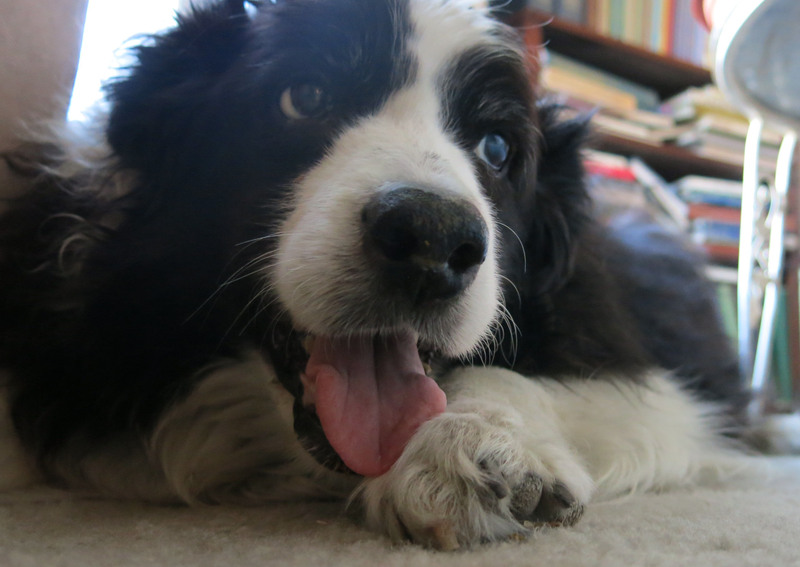 Greetings and salutations, everyone; yes, once again it is I, Chess the purebred border collie, filling in for the guy I live with, and here to bring you the eeriest news from our garden. You may remember me from such eerie posts as “Weird Light” and “More Weirdness”, among so many, many others. Well, at least a few, anyway. Here I am in a characteristic pose. The reason I’m looking so listless here is, not because I wasn’t making a list, but because the guy I live with was certain I was “a goner” today; I wouldn’t eat any of the various stews he tried to get me to eat. He finally–finally–got the message and fried up some steak in butter, and that’s what I had for afternoon tea. About the eer. The guy I live with, who, it should be said, isn’t really a big noticer of things, like I am, noticed this object by the front porch this morning. There wasn’t a note or anything, and he couldn’t figure out who put it there. It certainly wasn’t me, and no one else was talking. The guy I live with was about to hire a private investigator when the phone rang, and the person who delivered the cactus confessed. It wasn’t so eerie after all, but it made for a nice mystery. There are other things going on here, and I suppose I should talk about them, at least a little. 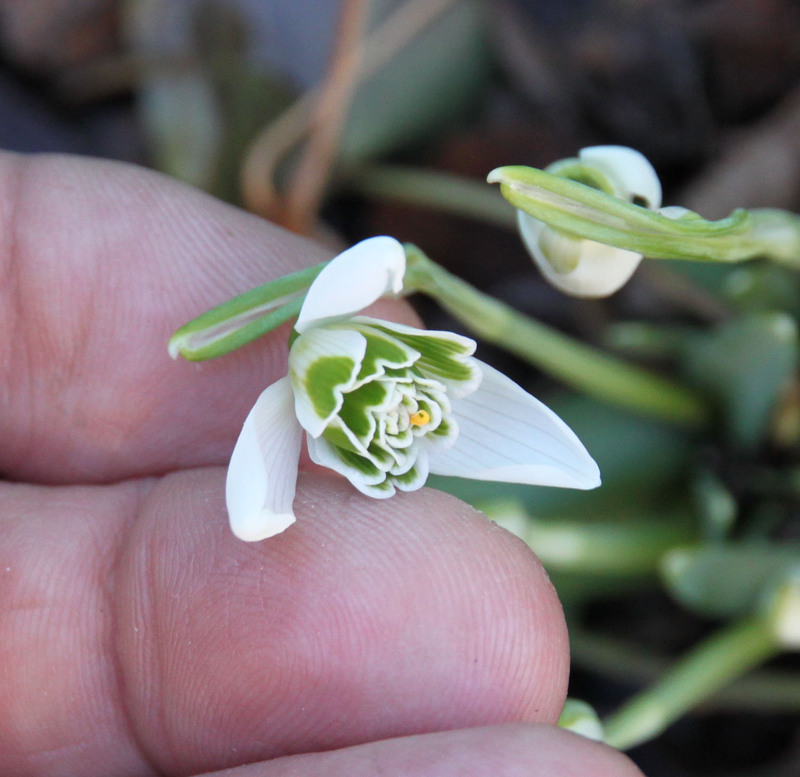 Snowdrops, of course. The double-flowered ‘Cordelia’. (Those aren’t my fingers.) 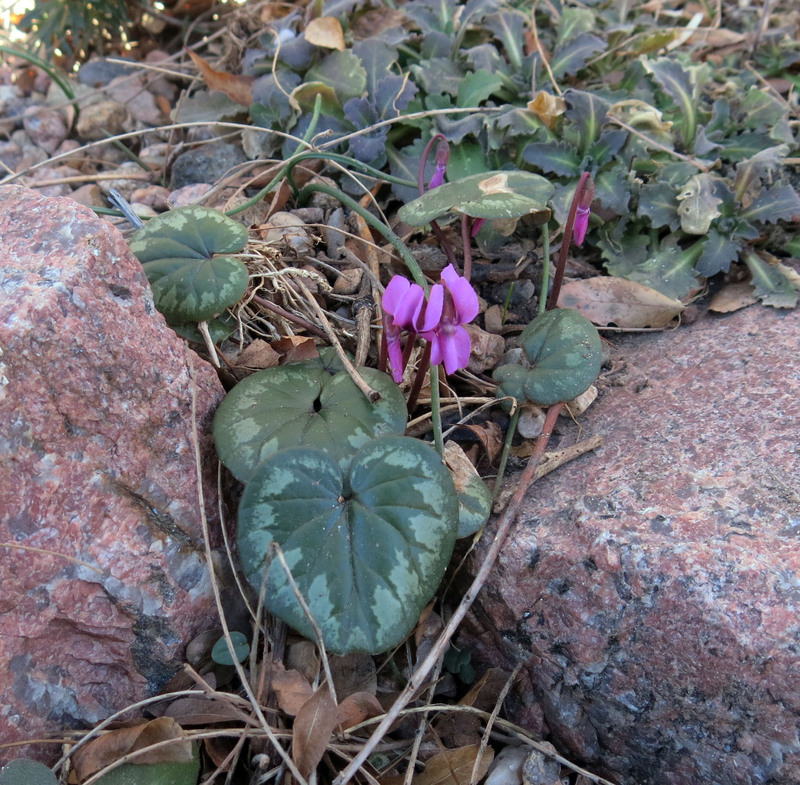 Cyclamen coum is flowering. 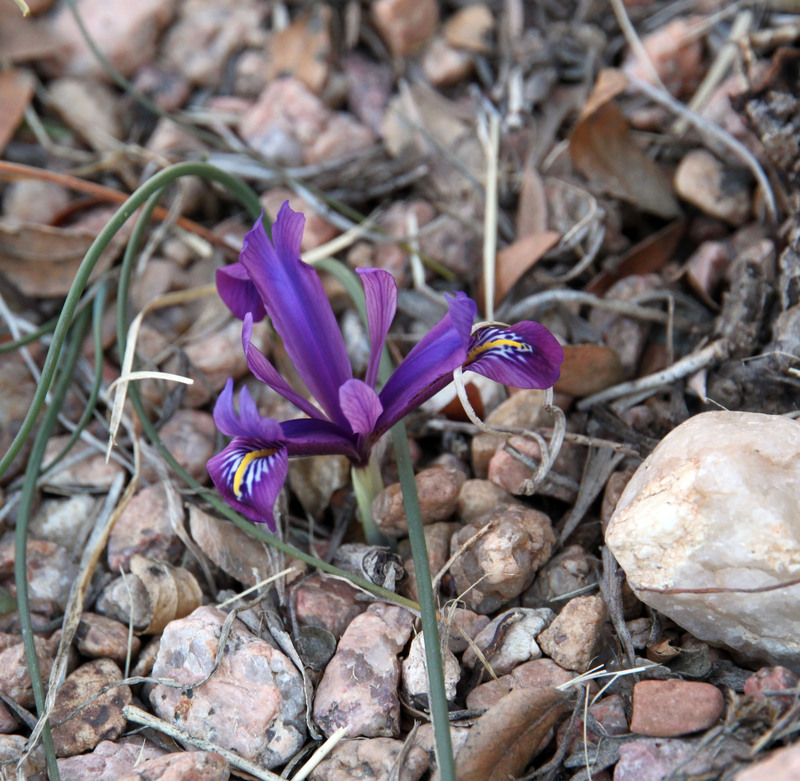 And some spring-flowering colchicums. 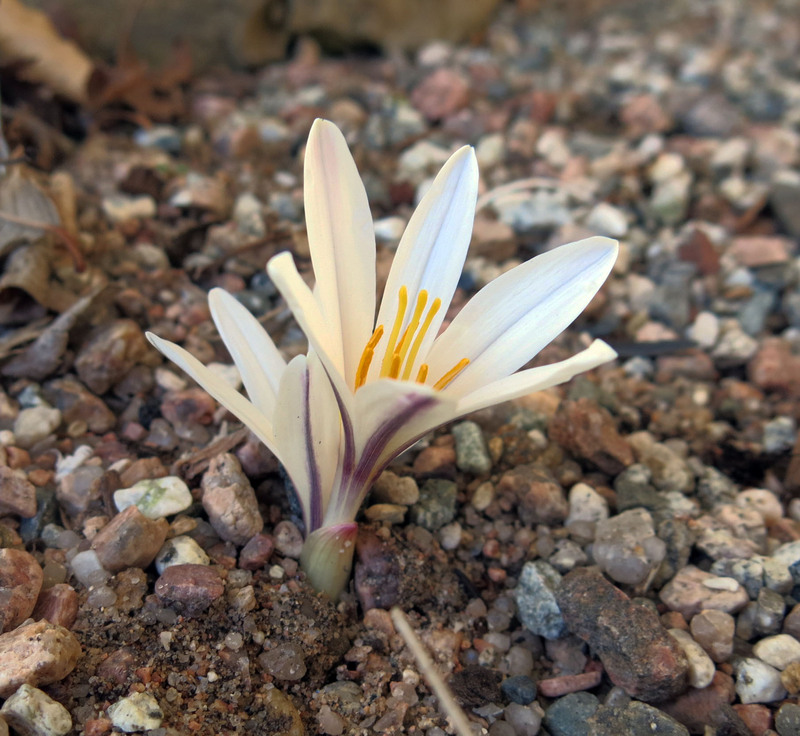 If you thought colchicums only flowering in the autumn, well, you would be terribly, terribly wrong. 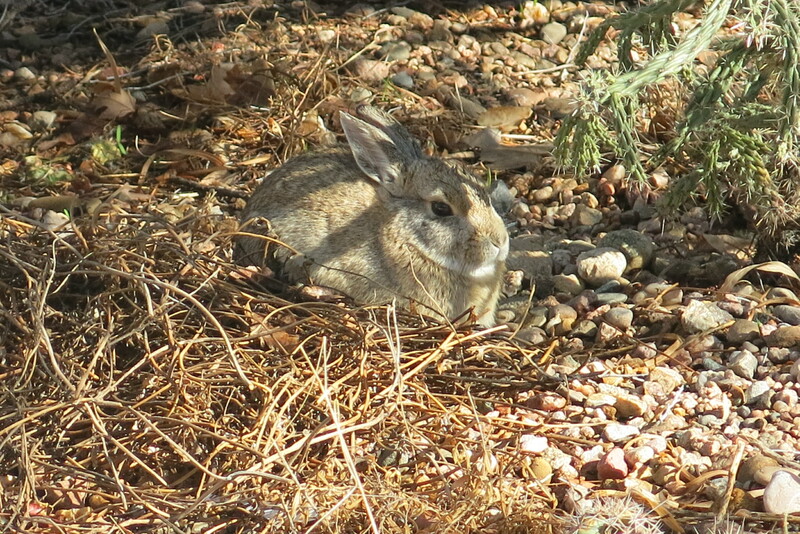 Though you would be forgiven for not knowing this, since it’s a fairly arcane area of gardening. An iris that “got noticed by accident”. That’s all there is. I hope you enjoyed the pictures, and our little mystery, which wasn’t really so eerie after all. I have to go now. I think I hear steak being prepared. 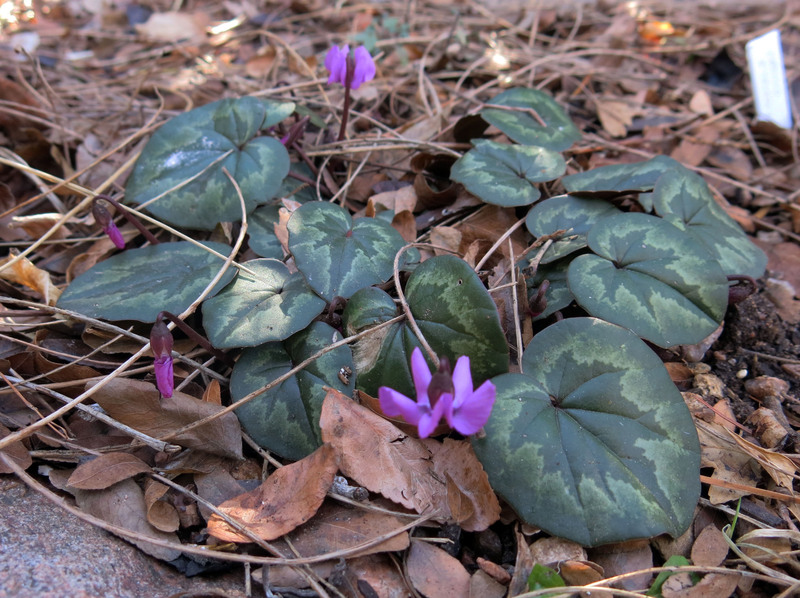 This entry was posted in Uncategorized and tagged Cyclamen coum, snowdrops. Bookmark the permalink. So that’s what steak anticipation looks like. It looks good on you, Chess. I’ve never seen that look on the pups I live with. Or on myself, come to think of it. Is the mysteriously appeared cactus a Valentine? That’s what it looks like. Waiting for steak. The cactus was really a pro quid pro, not a Valentine’s thing. Always nice to notice Colchicum kesselringii, especially before the slugs do! Then you don’t probably have those? Do you have the cross with C. luteum? I have found the former a lot easier that the latter. Funny to see the opposite season unfolding. I of course have autumn flowerers, including Colchicum variegatum and neapolitanum, as well as Cyclamen hederifolium and C. intaminatum. Slugs? No, we don’t really have those. We see one about once every ten years or so, and the guy I live with says, “Oh, look, a slug.” I sometimes watch one move across the wet patio, very, very, very slowly, before I fall asleep from watching. We don’t have the cross, or, for that matter, Colchicum luteum but maybe we should get that. huh? Get all of them, I mean. The guy I live with is kind of acquisitive when it comes to plants. We have Colchicum hungaricum, though. Two forms. It’s funny to think of “down under”. The guy I live with read me something about how it couldn’t possibly rain “down under” because the rain would fall away from the Earth. Isn’t that funny. People can be really weird sometimes. My Aussie slugs think Tadjikistan colchicums are caviar..
C. luteum is worth growing but it’s a long haul from seed. Janis has it but maybe he isn’t listing? Who wrote that book? Not anyone who has had an apple fall on their head! People have thought all sorts of wierd things: falling off the end of the earth, Elvis is alive and well and living in Surfers Paradise (although there? I’m not sure why), burning people at the stake casts out evil spirits, shooting young Aussie men in Indonesia keeps people off drugs, killing albinos in Africa protects the tribe, that there’s a tooth fairy …. No, it was something on the internet. Dumb things people say, or something like that. Oh, Lithuanian Rare Bulb Garden lists two forms of Colchicum luteum. 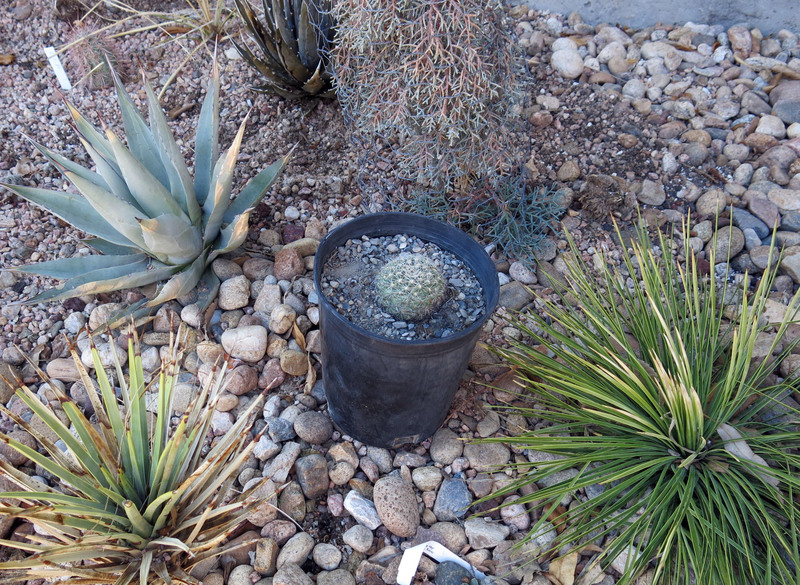 The guy I live with doesn’t like “long hauls”, except that he grows cactus from seed. Talk about a long haul. This is mostly compulsive behavior but I don’t worry about it. Much. Looked at that. You become a friend of the botanical garden or something, and they send you a seed list. About 300 species of seed have been sown here this winter, so the level of exhaustion is getting fairly high. Maybe next year ….. There are arcane areas of gardening? Guess I read about them here. Now that’s eerie. Chess as purveyor of arcane, have we ever seen that look? Perhaps that’s your look in the top photo. Love how two photos are necessary to convey your steak-in-butter-fry-up-hearing look. Other things I like: cutie pie rabbits, almost overlooked iris, and a certain gorgeous finger-enhanced double-flowered ‘Cordelia’ snowdrop. About Down Under: when I’m mopey about the traffic increase in my particular paradise, I remind myself of the beautiful port town Hobart, Tasmania, and the possibility of immigration. Good to know I can still read about your musings and doings while I’m upside down. I need to keep in touch to know the day is Friday the 13th, which I didn’t know until I hit your “again” post, Chess. Was a time this day enjoyed much bigness. People talked about the significance and newspapers noted the occurrence. As for me, Chess dog, your enjoyment of steak in butter ranks much higher in importance than some silly date. Thanks; the guy I live with indulges in “one of the most esoteric and lonely of all horticultural activities”, the growing of oncocyclus irises (especially in the garden). You can Google “Silken Sad Uncertain Queens” and download the PDF scanned from the Alpine Garden Society bulletin; article by Jim Archibald. So, yes, there is such a thing as Horticultural Arcana. Like the brown-flowered roses. Or old carnations (many of which have disappeared from cultivation, unless they are hiding in forgotten corners of abandoned gardens in England, say). And so forth. The guy I live with would point out that it could very well us who are upside down. Like, since when is North really at the top? Maybe it’s on the side, or really South. Like in those space movies where the spaceship always flies straight ahead, and never down or up. I mean, does the universe have a top and bottom? Anyway, the steak was pretty good. And your brain turns every image “upside down” so we can see it right side up. It’s St Valentine’s Day here. Poems, chocolates and retail. I bet it does. Though now I’m certain that we’re really on our side, and there is no up or down. Tomorrow I hope there won’t be any heavy sighs, because Valentine’s Day was a big deal around here for many years. 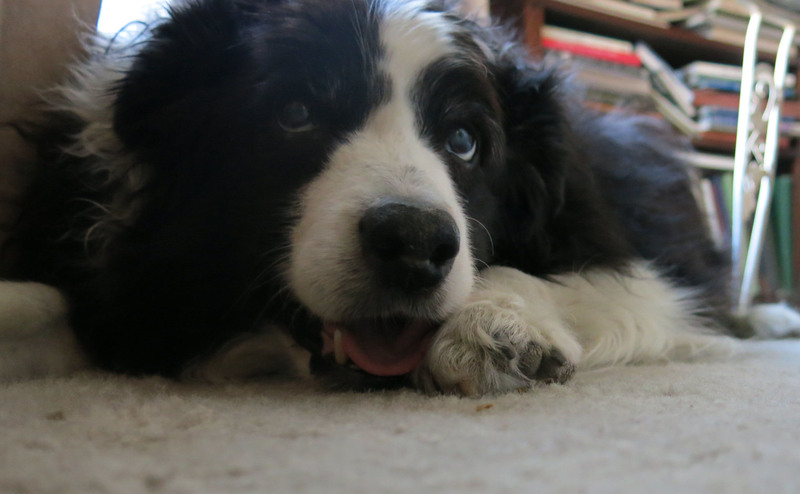 Though, being a purebred border collie, I don’t get this, but the guy I live with tells a story of when he was sort of little, and one of the neighbor kids baked a Valentine’s Day cake for his parents, and decorated it with the words “Happy V.D.” which he always thinks of on this day. Yes, it is quite delightful, and at the same time mildly aggravating, because it causes Hyperacquisitivosus Plantarum in you-know-who, and he pretends not to be acquisitive at all. Either that, or a desire for large amounts of money, and a way to become invisible, so as to be able to sneak around the countries where the irises grow, collecting seed. Oh, I guess the seed would be visible, and that would look weird. Yes, seed packets roaming about unaccompanied through airport lounges and hotel foyers raises the “poltergeist” stakes to a new level. Maybe you could grow a very thick beard and “transplant” them in there? I wouldn’t recommend the drug mule MO. The funny thing is that no one wants to go to Iran and collect seed. The guy I live with has a long list of bulb seed……. Innocence reigns supreme around here. Don’t know gardening has come under attack from so many different places, but, like, whatever, huh. If you think smuggling iris seeds is hard, trying getting two jars of marmalade past the TSA. I came back from Florida last week and the guy who makes you take off your shoes got all Dragnet on me when he saw two jars of Florida marmalade hidden in my carry-on. I got the whole “Stay where you are!” and the whole guy-powder or bomb-detecting wipe-down of person/shoes/contents of carry-on (which was only the messenger bag I carry everywhere), and the stern warning that if I didn’t go to back to the gift shop RIGHT NOW and mail those 2 jars of Florida marmalade to me at home then he would confiscate both jars RIGHT NOW. Iranian Iris seeds would come under the heading “bio-terrorism” and you don’t want any part of that. 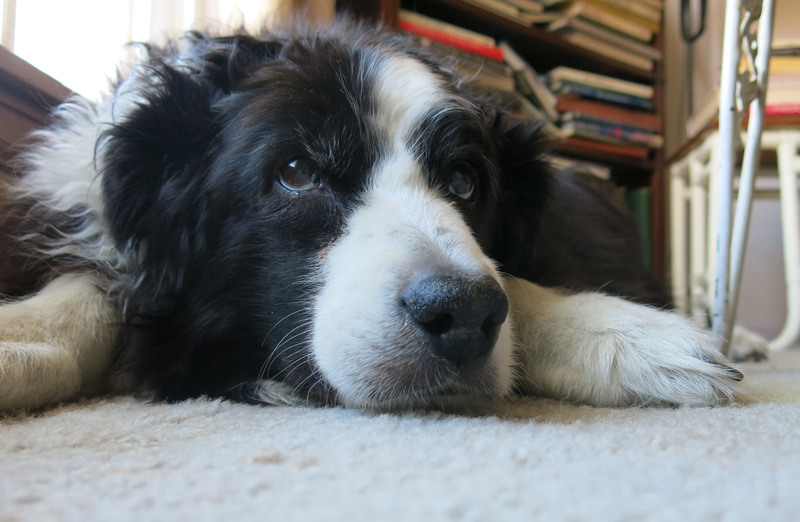 Dear DoG, you can’t be gone! There are still so many butter-fried steaks to eat! Thanks; well, morning are kind of rough for me, what with being dragged out of bed and all that. Actually, the guy I live with has a seed import permit and so anything that got snuck out of a country would have to go somewhere else and then sent here, via customs, who look at everything. Iran probably isn’t a “prohibited country” when it comes to flower seed; just getting in and out is the problem. In one of his seedlists, around the turn of the century, Jim Archibald described how they snuck into Iraq and then snuck back. (“You what?” “I snuck”. Think that’s from The Little Sister by Raymond Chandler.) Anyway, marmalade, that can obviously be dangerous. Keiller makes an excellent one. Well, orange, and three fruits, and ginger. We have some old ceramic jars around here, now marmalade-less. Dear Ms. Swift, you are so lucky. Around here, the marmalade would be dumped into a marmalade-sucking machine right before your very eyes. Rick Steves has gone to Iran recently. Just saying. What a great marmalade quotation. 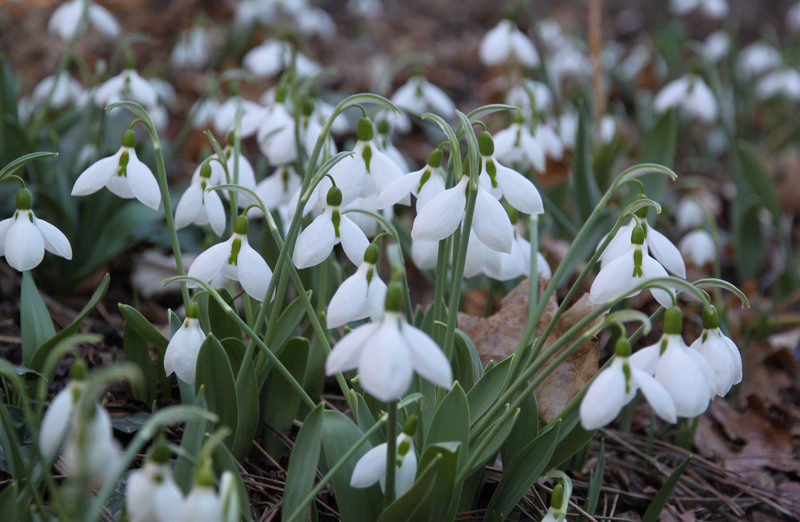 I love it, and the double snowdrop, and the fact that Chess ate a yummy meal. Three Gardens is one of the guy I live with’s favorite gardening books. He’s read it about ten times. I had some steak, and pumpkin for “afters”, and then a few biscuits, and some jerky bits. You’re welcome; the guy I live with wondered about “the excellent packeted parsley sauce” and a friend of my mommy’s sent a couple of packets (Knorr, I think) from England. He also says that soft-boiled eggs with toast buttered enough that it’s soggy in the middle are completely excellent. Thanks. We can edit the comments, you know, but typos are okay.